After the end of a long absence from our Internet Website, we are in the happy position to be with you once again. With the prayers of our Archbishop, His Eminence, Amfilochios, Metropolitan of New Zealand, and with the help of God the work of our Ierapostolic (Missionary) Metropolis progresses. The Vineyard is plowed and cultivated. In the last twelve months in our Metropolis, many and varied works have occurred to the glory of God; works, not only material reconstruction, but mainly spiritual. In all the Orthodox communities of our Metropolis, the word of God is being regularly heard, through the holy services, catechism and visits made: by clergy, monks and laymen that the grace of God, made worthy to come and stand beside us, offering help with their great love. 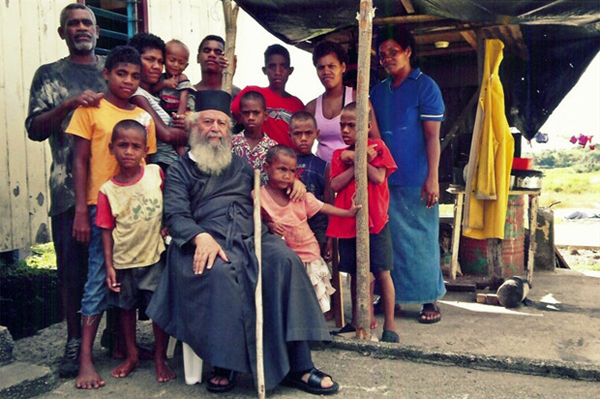 Primarily and most significantly, Orthodoxy is spreading in Oceania. In Fiji our church now numbers more than 100 newly illumined, (specifically 126) newly baptized Christians, as well as many catechumens–the sign that the number of believers will continue to increase. At the same time the organization of the church is also expanding. There now number three Sacred Churches, two on theislandofViti Levuand one on theislandofVanua Levu. On the first island, that of Viti Levu, specifically in the village of Sabeto near Nadi the Sacred Church of St. Paraskevi was built and now functions. This is alsowhere the centre of our Ierapostoli (Missionary activity) is based. On the same island, in the village of Saweni, the Sacred Church of the Dormition of the Theotokos operates. On the same property are other buildings/spaces which will comprise the Sacred Monastery of the Fiji Islands. The Sacred Church of Sts. Athanasios and Nicholas is found in the town of Labasa on the island of Vanua Levu. At each of the Sacred Churches there is a rectory and a garden for each priest. In the village of Saweni Lautoka, a property was recently purchased where, with God as our help, we will build the central church of the Holy Trinity. The foundation stone was laid in February of 2012. On the property of the above church, specifically on either side of it, a school for Orthodox children and an orphanage will be built. And soon, on the same island, within the next six months, theSacredChurchin honour of St. George will be built. The Sacred Mysteries are being offered from each of our three indigenous priests: Fr. Bartholomeos, Fr. Barnabas and Fr. George whose ordinations to the Diaconate took place in Rhodes, and whose ordinations to the Priesthood took place in Thessalonica, Greece. This year the Greek Orthodox Church was officially recognized by the government of Fiji.The economic support for this sacred work comes from the Fellowship of External Missions of Thessalonica and from friends inGreeceandAmerica. Recently, support has also been coming from persons fromAustraliaand in part from persons fromNew Zealand. For the celebration of the Sacrament of Sacred Baptism, in the courtyard of the Sacred Church of St. Paraskevi, a Baptistery in the shape of the Cross has been built, as has also been done in Levin at the Sacred Monastery of the Holy Archangels and in the courtyard of the Sacred Church of Sts. Athanasios and Nicholas. And in New Zealand as well, in a spot not far from the city of Levin, about an hour and a half from the capital of Wellington, the first men’s Sacred Monastery has been built and is functioning to the honour of the Great Archangels Michael, Gabriel and Raphael. Stationed there are two monks from Greece and one New Zealand born monk whose tonsure took place on Holy (Great) Monday and who received the name Michael and one other Monk who is a Greek from Australia. Slowly, slowly the Sacred Monastery is becoming the Ierapostolic (Missionary) centre, where Orthodox of various ethnicities come to worship (Serbs, Russians and other) and now the New Zealanders themselves have begun to draw near. 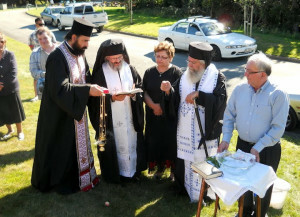 On the 31 of March, 2012 a lady New Zealander approached Orthodoxy (she was baptized) and received the name Philothei. Another New Zealander who is a professor at the University in Christchurch, Matthew, is presently considering to be enrolled in the Brotherhood of the Sacred Monastery. The Fathers of the Sacred Monastery in Levin occupy themselves with the maintenance of the Sacred Monastery as well as with their various obediences.Their primary chore (obedience) is the manufacture of candles. They hand dip candles which supply the needs of the Parish Churches of our Sacred Metropolis. Another one of their chores (obediences) is apiculture (bee keeping); from this work they produce a honey of the highest quality. And now recently the brotherhood has become occupied with the production of high quality baked goods of various tastes (primarily paximadia) from New Zealand wheat which is milled in the traditional manner of the wind mill turning a mill stone. Recently the Sacred Metropolis was strengthened by the arrival of two new clergymen: Fr. Demetrios Kotrotsos and Hieromonk Konstantinos Triantafyllou. With the help of God the plan of the Catholicon of the Sacred Monastery has been completed. Abutting the Temple on its south side is the Sacred Chapel to the honour of St. Basil the Great, and on its north side is the Sacred Chapel to the honour of St. Amphilochios, Bishop of Iconium. (to the Diaconate and to the Priesthood) by the hand of our Beloved Archbishop, His Eminence Amfilochios, and in our Sacred Metropolis. With the help of God and to the glory of His Holy Name, our work continues. We thank you that we meet once again and we will endeavor to keep you informed, as much as we are able, more regularly concerning all of our developments both within New Zealand and in the islands of Fiji.